Every workplace needs to have safety signs and labels, whether they are as simple as reminders about no smoking areas or as specific as a label identifying the contents of a pipe running along the ceiling. Your workplace might need safety labels, Globally Harmonized System (GHS) labels, pipe marking labels, first aid labels, fire safety labels, and way finding signage. Some signs, such as Caution or Warning signs, must meet certain requirements for format, colors, headings, and text. Others might use a format or color scheme set by your organization. Regardless, these labels need to be eye-catching, easy to read, and capable of holding up to the conditions of your workplace (hot, cold, wet, etc.). The articles below cover many aspects of the labeling process, and many pertain to specific types of labeling such as hazardous chemical labeling and pipe marking. You’ll find plenty of information to help you navigate the process of workplace labeling. 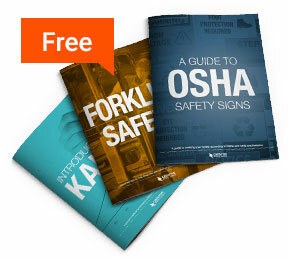 Check out the free guides to the right, too, where you get can more information about marking your facility with visual tools.